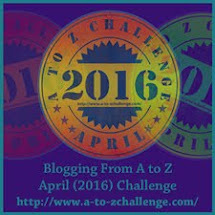 Its the daily blogging A to Z challenge! 26 wee letters in the alphabet starting with A on April 1st. Sounds simple doesn't it? Guess what my topics will be about? 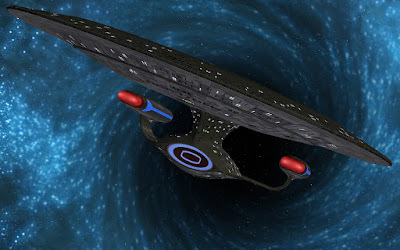 Now set your phasers on stun, sit back and engage your warped hive mind because its time for some trek delights. 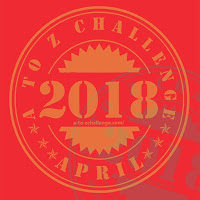 I discovered the A to Z challenge on Alex J Cavanaugh's blog. I'm hoping this trip doesn't overload my little grey cells too much or I'll be heading straight to Dr McCoy's sickbay for a good shot of Saurian Brandy. A good slug of the good stuff usually does the trick. Meanwhile back in the Galactic realm of Star Trek reality, Spacerguy will attempt to expound on every letter in the alphabet for the month of April. Wheres Data when you need him? Hey, Alex suggested using a theme and I know a good A to Z spin off. Remember the librarian MrAtoz from the planet Sarpeidon in All Our yesterdays? We could launch it as Mr Atoz's Trek Challenge! Star Trekkin' across the Universe. I love this original version of the Firm's song "Star Trekking across the Universe." So I've added the lyrics so you can join in the fun and sing along. What I can't figure out is what happened to the Klingons? Weren't they supposed to appear off the starboard bow? maybe they're hiding somewhere.... Enjoy your Star Trekking, Trekkers. it, not as we know it, Captain. You can not change the strength Jim of the engines. 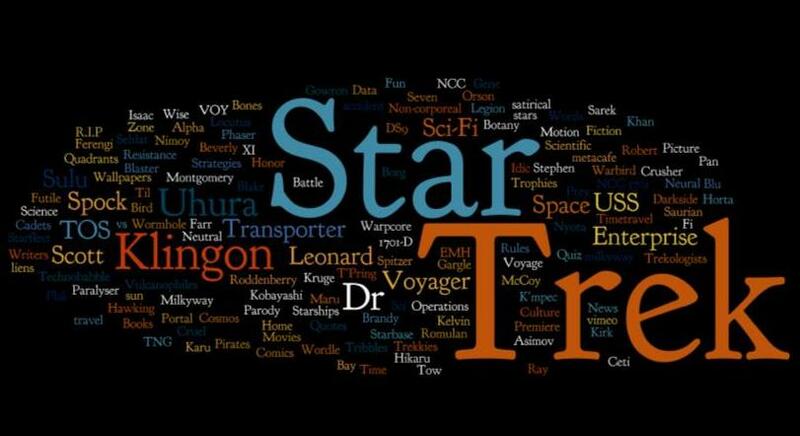 Starfleet duty isn't for everyone but Wordle is fun! Don't feel too bad if your inner Trekkie isn't psyched up for the challenge. Remember the Psych Test in Star Trek TNG? Wesley Crusher failed Starfleet's entrance exam the first time round bringing Picard's blood to boiling point. But it was weird because at least Crusher did find the courage to face his fears and confront the angry Zaldan. Remember him? The Zaldan's webbed thumbs totally busted him for the Enterprise whizkid but it caught the rest of us off guard. Thousands of star trek fans were stumped that day(LOL) including Starfleet's first Benzite, Mordock who beat the USS Enterprise NCC 1701-D uber geek. So Captain Picard has a little chat with Wesley and urges Crusher to pull his socks up, flunking a second time simply isn't allowed. Successful entrants must excel with their class at a multitude of mental and physical tests or merit the wrath of the Academy instructor! I guess no-ones perfect. Now have fun creating beautiful Wordle clouds. Live long and Prosper and remember to challenge your inner Trekkie. 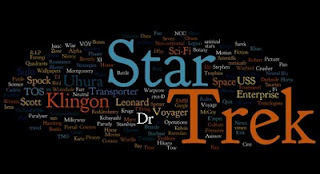 Star Trek Sci Fi Blog has undergone some minor metamorphosis. You may have noticed that I've changed the previous header image which displayed the starship USS Defiant NCC 1764 in favour of a bright starry cluster with the USS Enterprise NCC 1701 making a quick getaway. What do you think of it? How I wish I was aboard but thats another story. I must point out readers, that Star Trek Sci Fi Blog's fresh lively look came about after much deliberate consideration. I'm glad you're enjoying yourselves. The new header image illustrates the Pleiades star cluster located in the constellation Tarus. I am indebted to my comrade Nova Dove for sending "Pleiades" to me. The odds are against us and the situation is grim, full speed ahead Scotty!